John went with the recruiter Tuesday night to stay in a hotel. In the morning at 0-dark thirty (5:30 a.m.) he and the other 30 folks down there for their physicals, were awakened and herded off to the military base where they were given their physicals. John returned yesterday evening to report that he will have to go back for a follow-up EKG but they believe he will be acceptable to endure bootcamp and Army life for a few years. He is talking about signing in for four years. Part of me would prefer a shorter period as one has a tendency to become a target while out doing one's job and less time in would mean less time at that. On the other hand, John needs to have that time to grow up, learn responsibility and earn enough money to get himself started. He said the worst thing about the physical is when the doctor had him drop his drawers, and cough while at the same time grabbed his testicles. "His hands were COLD!" John reports. The funniest thing was when they had the whole gang of men and women come together and walk across the room "like ducks". He said everyone made it -- even they fellow who was shot in the knee in Iraq and was trying to re-enlist now that he was healed up. "He fell over when we were duck walking, but they said he passed," reports John. Makes me wonder a bit. How desperate are they? In the end I just ripped the whole thing off the needles and decided to work on them tonight when I can sit quietly under a good lamp with a glass of wine and hope the yarn hasn't been split so badly I can't knit with it. I would like very much to have the socks finished before he leaves for boot camp (so the EKG delay may be a good thing) but I may have to order a different yarn as I don't have any other black sock yarn. BTW, John has heart surgery at age 7 to repair an Atrial Septal Defect. The surgeon assured me that he fixed it. But the Army wants to make sure he won't drop dead on them while they are running him around at the base. Yarn Harlot: I always hated buttonbands. I love the analogy between parenting and knitting a sweater. Makes me realize that we MIGHT all survive. I wonder if there is a way to raise money to support organizations fighting global warming through knitting? I live where the Chesapeake Bay meets the Potomac River. When Virginia was slammed by Hurricane Isabel, water was shoved up the Bay and having no where else to go, started backing up the Potomac River and eventually overflowed her banks. I did not see the destruction myself but I know of people who lost their homes in the flooding who had never so much as seen water touch their front door stoop before. I am about 14 feet above water. I think. I need to go check a good geological map to make sure. I might be a little lower or a little higher. I will most likely be dead by 2100 when they are saying sea level will rise by 20 feet. However, about 60 years from now, my house will be waterfront property if global warming isn't stopped and reversed. The time to start doing something was 10 years ago (or more), but we are still floundering trying to even imagine solutions and are taking no concrete steps towards correcting the problems. Maybe I need to get to work knitting an afghan with a picture of Mother Earth on it as the seas were 103,000 years ago (which is what scientists are predicting for us in 2100 if trends are not corrected). The way I knit, it will take me 60 years to finish this afghan, but by then the cost of living will be so high because there will be so little food available, no one will be able to afford to buy it anyway. I will revisit this topic at some point. I'm feeling to cynical about it right now and am not offering any real ideas for solutions. I wonder if anyone is already knitting to support the reversal of destruction? I must say I am discouraged and deeply disappointed that the "enlightened" generation from the 60s is the same generation which is running the U.S. Government now. They may not be the elected officials, but certainly the civil servants and the "lifers" who are one or two levels down from the top. Anyway, finally completed the paperwork so he can get John's medical records. If the Army doctors say he is good to go after they review his files, then he goes down for a physical and a day of placement testing. Three weeks or so after that, he's off to boot camp. I have a hard time believing right now that he might actually be out on his own this soon. Part of me is relieved. Most of me is scared to death for him. He has no goals. He has never completed anything. I will be delighted if he makes it through his contract, I won't be surprised if he doesn't. But once out of the house, we have made it very clear he will not come back here and must survive out in the real world somehow. I'm sure I will help him get started with some furniture, perhaps a month's rent... but if he flunks out of the Army, he's screwed. And I think the hardest lesson will be for me to learn to close my eyes and let him go. If I rescue him, I will destroy him forever. He must learn to make the effort. Starvation is a good motivator. I completed the first Cherry Hill sock last night. I lost a whole evening of knitting because I had to untangle the end of the ball. Of course I put it on and discovered all my mistakes. But it fit almost perfectly. Ken chuckled at me and pointed out that I really should take it off and wait to wear it with it's partner. "So it wears evenly," he said. But the man knows me well and is trying to encourage me to both finish and start sock Number 2. If I don't let myself wear Number 1 until Number 2 is finished, I MIGHT actually finish Number 2. So, in the interest of doing that, I cast on 56 stitches for sock Number 2 and went to bed. That black object above my foot is my slipper. I did learn from the making of sock Number 1. I learned that trying to remember what you did a week ago so you can repeat it, is not going to work and I must take notes. I learned that making socks isn't hard but you must pay attention to what you are doing. I learned that one should keep a tally of how many rows you are making. I will make Number 2 as close to the same as I can manage, but in future pairs of socks I will also make a wider heel flap. Apparently, my heel is a bit wider than "standard" and my feet would benefit from something a wee bit wider. 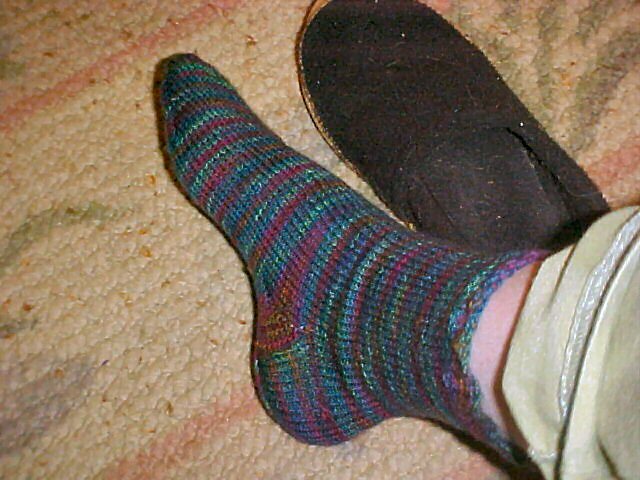 I was very excited to find several cool ways to decrease at the toes from Folk Socks by Nancy Bush. I used her first suggestion on this sock (and will use it on Number 2), but on my next set of socks, I think I will branch out and try other toe and heel techniques. 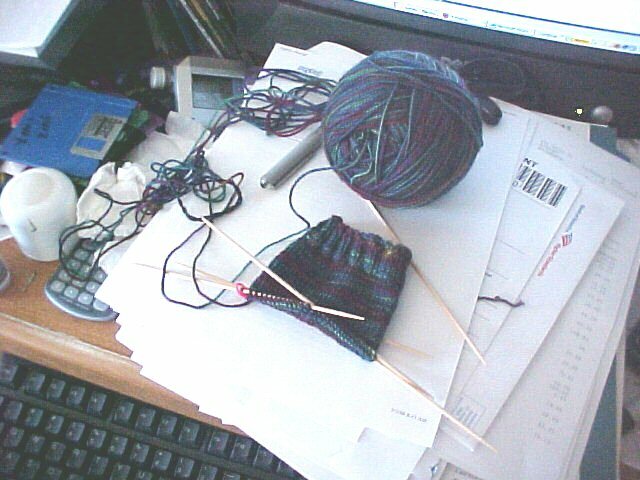 Two of the things I really like about socks is that it will not take months to finish a project and they are very portable. There is minimal finishing with only two ends to weave in. The yarn cost how much? Well, I let the cat out of the bag the other day. Ken had no idea how much money I was spending on my yarn addiction until yesterday. I was trying to untangle the end of a ball of Cherry Hill Yarn that was tangled only because I balled it up wrong in the first place. He asked me if all the trouble I went to to make hand-made socks was worth it? "Of course," I told him, "Or I wouldn't spend so much on the yarn!" His eyes got narrow and he tilted his head to the side. "How much do you spend on the yarn?" "Well," I responded slowly, trying to figure out how to get out of this one, "It depends on the yarn." "How much was THIS yarn?" "Well, I found out I could get it a little cheaper on eBay, but this skein was a little pricey. But I really like it." I was winding rather madly as a long section came loose from the knot pile. I cringed. I looked away. "Twenty." "I could buy 15 pairs of socks for THAT!!" "Yep," I responded. "And none of them would fit this well." He started grumbling about my credit cards. I pointed out that I bought all my yarn from my checking account. I pointed out that my yarn budget came directly from the money set aside from my previous addiction: smoking. At 2 packs a day running $3.50 a pack... $7.00 a day goes into my yarn budget. That's roughly $210 a month (and I don't spend nearly that much a month on yarn -- in fact, I spend some of it on him and the boys). He got quiet. He settled down and watched TV. Later, before bed, he went out on the porch for a smoke. I finished unraveling the tangle tonight. It's all good. I got home from work yesterday evening and it was 79 degrees outside!. I turned off the heat and opened all the doors and windows. The house feels and smells much fresher already. It's 55 degrees outside this morning and does feel a little nippy but I want to keep the heat off and the window's open! The weather gurus are calling for thunderstorms tomorrow with tempertures in the high 60s. In any case, I'm glad I have some smaller projects to work on as a big heavy afghan or sweater would really make me feel hot. Believe me this doesn't happen often. In fact, it is so rare that it took a couple of days for it to sink in. But my mom paid me a compliment. It was her birthday and I took her gift and card over. She lives about 10 minutes away but I only see her about once a month because growing up she repeatedly reminded all five of her children that she would not raise her grandchildren and she was raising us to be self sufficient so she would never be forced to take us back in. All five have survived. None have moved back in. Mom is stingy with compliments. She thinks it's required so we remain self-sufficient and strong. Now mom is an awesome knitter. She's been knitting for as long as I've known her. She's also an artist and has won national awards for her watercolors and colored pencil works. She tried for years on various occasions to teach me to knit. I resisted. I rebelled. Last summer I gave in while trying to help my step-granddaughter to knit, I found out it really wasn't that hard. It's sort of like one of those games like checkers: takes a moment to learn and a lifetime to master. When I got home from the beach I went out and bought myself some knitting needles. On one of those monthly visits to mom's house I showed her the scarf I had started. She invited me to her stash closet and unloaded a couple of garbage bags of yarn on me. Instant stash. I made scarves for numerous people for Christmas/Yule. Some of them sucked. I made myself a whimple (sort of a cross between a scarf and a hat -- basically a tube that goes over the head and covers the neck. I experimented using fun fur, microspun yarn and even incorporated two colors. I have had many compliments on it. I know where all the mistakes are but still wear the thing daily. Then I tackled my first sock. I frogged it. 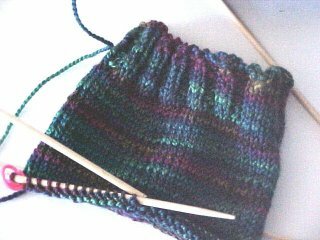 I started another in worsted weight using a basic sock pattern (you can see pictures below.. it's the green one). Anyway, I took the lone green sock to my mom's to show her what I had done. She gushed over it. She was amazed. I had done the thing and turned the heal and done the gusset and didn't call her once. For a first sock it wasn't too shabby. I at least learned from it and now I'm on to a real sock with real sock yarn. My compliment from mom, the one that still makes me smile? "I think you found your calling. You're good at this!" Congrats mom, you succeeded. I can now feed myself, keep a roof over my head and now I know how to clothe my family as well. Here are a couple of pictures of the socks I'm working on now. These are in Cherry Tree Hill sock yarn. 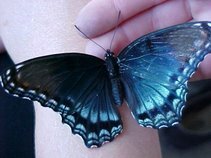 The color is Peacock. The picture is a bit light and the color is a bit richer. In any case, this is close. I have order more sock yarn from Simply Socks. Still waiting for the yarn from Socks That Rock. I know they are overwhelmed but it might come this week. I read about this on a yahoo knitting list. I read the blog where it was posted (see link above). I re-read it. I had a really nice chat with the Army recruiter yesterday. I had forgotten how polite military folks can be. He assured me that all is not lost and he is going to come by today with paperwork so they can get my son's medical records. He turns 17 Thursday of next week. His GED certificate should be in the mail by now. With any luck at all, he will be in boot camp by mid to late May. In knitting news I woke up yesterday predawn (3:30 a.m.) and found I could not go back to sleep so I got up and decided to wind the skein of Cherry Tree Hill yarn into a ball. Since no one else was awake I used the back of a chair. At one point I had a rat's nest to untangle, but got the whole thing untangled and balled (center pull, at that) by the time my youngest left for school at 7:20 a.m.
Then I cast on 56 stitches and started the 6-Ply Socks Ellen's Birthday Socks by Nancy T. McGlynn. Oh my goodness, this is some pretty yarn! I am very excited by this color, the way this yarn feels in my hands... And I am having a very successful time with the k2p2 ribbing this time. I did discover I have to really pay attention or I end up an odd yo here and there and have to go back and fix it. In any case, I'm going to start these over for the third time tonight away from the TV when I can quietly concentrate. I had to work late last night and didn't get home until 9 p.m. and went almost immediately to bed having risen so early. I like this yarn so much and I like the pattern so far. I may end up keeping these socks for myself. And maybe I will get the opportunity to knit some socks for my soldier son in the near future. Please tell me this works because right now I'm seriously thinking of choking my son. He dropped out of school at age 16. He cannot get a driver's license until he is 18. We live 10 miles from the nearest business. He is unemployed. He took the GED test and we are awaiting his results (the folks who gave it to him think he passed, thank goodness, but we still have to wait for the certificate). He turns 17 next week. An Army recruiter came to talk to him today. Also today, he hacked into my husband's computer and crashed it, bashed a hole through the wall in my entry hall because he said he tripped over a rug and hit it with his shoulder and forgot somehow to feed the chickens and rabbit and failed to mop the kitchen floor like I asked him to do yesterday. I am soooo ready for this kid to be out of my house. I am going to call the recruiter tomorrow and beg him to hurry things up if possible. I can sign him in as soon as he turns 17 and while a week ago I was ready to wait on an Air Force recruiter, I'm fed up now. I am going to go knit for a while and have a glass of wine and try to calm my nerves.